I was traveling with my dad near Superior, Arizona. We were dropping down into the Phoenix valley from Queen Creek, and the Phoenix amateur radio repeaters are coming within range in range. Dad keys the radio mike and says, "N7KZH" just to see who is out there. The selected repeater acknowledges and goes silent. A few seconds later, the radio comes alive. 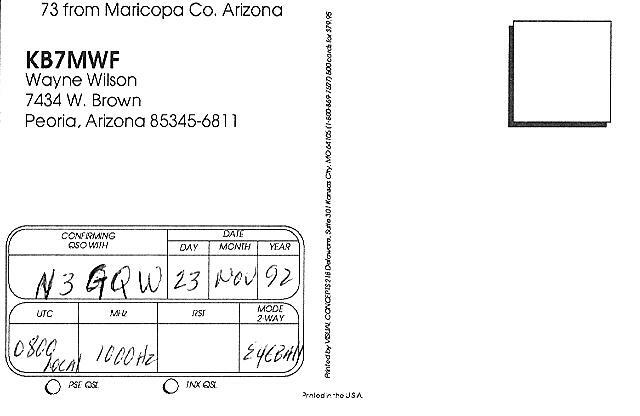 "N7KZH, this is KB7MWF." Dad says, "It's MWF! Monday, Wednesday, Friday! 'Wayne the Train' Wilson!". "Hello, George, how ya doing?" "Great, Wayne, I got my son here, visiting from Pennsylvania." "How'd the two of you like to meet with the local group for breakfast tomorrow? ", he said. I knew I was up for it. "OK, we'll see you there. 73". I also met Bill Lammers. He is a truck driver who lived two doors down the street from us when I was a kid. Because he was two years older than me we never played together. Now he too is a ham radio operator. He showed us several antennas that he had made. I have sinced talked to him on the road on HF. I commented to Wayne "That's an F45". Wayne said, "Yes it is". Arguably, it is actually an FP45, or to Santa Fe types, and SDFP45. Wayne ran the "Peavine", a secondary branch line that ran from Phoenix to Ash Fork (west of Flagstaff) on the ATSF main line (now BNSF). He told lots of stories. Dad told me about the time he was driving with my brother's kids, Nicolas and Lexi when Wayne called him on the radio. "N7KZH, this is KB7MWF, George, I've got a string of light engines here at Grand Avenue waiting for my train to be made up. Why don't ya bring the kids down and I'll let them see in the cab?" If Wayne was still with us I probably wouldn't tell this story, but not only did they get to see inside the cab, they also got to work the throttle, running those engines up and down the siding until Wayne's cars were ready. What a guy. But alas, about a year later Dad informed me Wayne was diagnosed with cancer and he died shortly thereafter. Wayne is now a "silent key", and a well missed friend and fellow railroader. 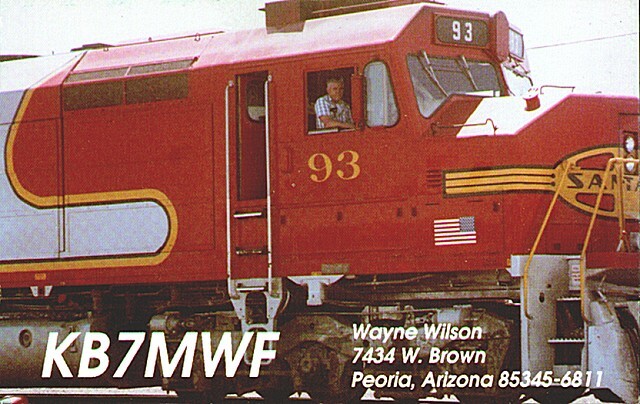 ATSF #93 As unique as Wayne. The only locomotive to wear all 11 of Santa Fe's paint schemes for the FP45.